Kundalini literally means “coiled”. It is envisioned either as a goddess, Shakti or “primordial cosmic energy”, or else as a sleeping serpent or “serpent power”. When kundalini shakti is conceived as a goddess, then, when it rises to the head, it unites itself with the supreme being, Shiva, and the aspirant becomes engrossed in deep meditation and infinite bliss. Kundalini refers to the dormant power or energy present in every human being, lying like a coiled serpent in the subtle body at the base of the spine. Kundalini is described as a potential force, and it is one of the components of the subtle body, which consists of nadis (energy channels), chakras (psychic centres), prana (subtle energy or vis vitalis) and bindu (drops of essence). When, by advanced yogic practice, fully aroused in deep meditation, kundalini flows up through the central nadi (sushumna) inside or alongside the spine, and reaches the top of the head, passing through each of the other chakras on its journey, vivifying them and thereby awakening the individual to self-conscious awareness in the superphysical worlds, direct intuitive perception and wisdom. 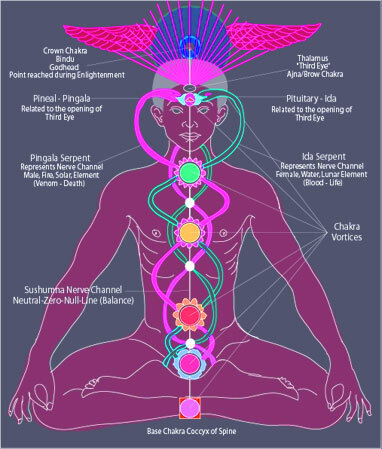 The progress of kundalini through the different chakras leads to different levels of awakening. This universal life-force, while still asleep, is the static form of creative energy which serves to vitalize the whole body. The nagas (serpents) of Hindu literature are none other than rishis, liberated yogis and enlightened adepts. In the biblical allegory of the fruit of the tree of knowledge of good and evil we find in the Genesis, the serpent is the symbol of creative energy and wisdom, the tree is the symbol of consciousness. Together they constitute macrocosmic and microcosmic creative power, a symbol of wisdom united with the mind. When the serpent’s tail is in its mouth, an endless circle is made, implying boundless wisdom and eternity itself. That is the union of a symbolised positive and negative charge. The serpent’s devided tongue may refer to the two main nadis (ida and pingala). Between these two oppositely polarized energies the mind is the balancing force. When ida and pingala get balanced and unite in the activated sushumna, pure consiousness arises and universal cosmic energy becomes avaible, likewise yin and yang, the two complimentary extremes that constantly play against and with each other and can not exist without the other, unite and dissolve in the neutral “flow of the universe” or “essence” called tao. One of the objects of activating the spiral fire and its progress up the spine to the head is to awaken the pineal gland, which results in the opening of the third eye and the consequent revelation of the subtler planes of life. Kundalini is a concealed power potent either to illumine if rightly employed, or to destroy if misused. Snake venom can destroy or heal, depending upon its use and dosage. This is also true of wisdom. The raising of the kundalini force, if brought about ignorantly and prematurely, may lead to serious nervous trouble, inflammation of the tissues, spinal disease, metabolic disorders and psychosis, but if allowed to proceed progressively and naturally through disciplined living, it will finally serve to open the gates to higher realms. The appropriate awakening of the kundalini shows itself as awakening of inner knowledge and brings with itself pure joy, pure knowledge and pure love. Self-realisation is said to be equivalent to divine wisdom or gnosis, or what amounts to the same thing: self-knowledge. When kundalini fully arisen one acquires the faculties of using supersensory awareness while still awake in the physical body, and of leaving and returning to the body at will without any brake in consciousness. The cerebro-spinal system of man, when vivified, resembles in many respects a wifi aerial. Indeed, the pituitary and pineal glands then function somewhat as does a television receiving set, thereby enabling consciousness to pick up and become aware of superphysical forces and phenomena. One difference, however, is that subtle broadcasts are projected upon the screen of the mind and clairvoyantly perceived. The full manifestation of these faculties during waking consciousness demands a long and arduous training, and depends upon the complete vivification of the pituitary and pineal glands by means of kundalini and its complementary forces. The tantras of Vajrayana comprises a system which is very similar to the Indian systems of kundalini yoga, in that they too manage a series of subtle channels, subtle winds, wheels and subtle drops, and they refer to a force known as kandali which must be raised up the central channel. Of course, there are some differences. Firstly, the descriptions are mostly about “red bodhicitta”, that resides in the lower chakras, and “white bodhicitta”, that resides in the crown. The “inner fire” is ignited, through practices such as tummo, which causes all the winds in the body to enter and rise up the central channel. When the fire reaches the crown of the head, the white bodhicitta melts and flows down to the lower chakras, producing profound spiritual experiences of bliss and emptiness. This practice of inner fire is seen as a preliminary yoga to a further set of practices, obtaining the “illusory body” and obtaining the “clear light”, as well as practices such as dream yoga and consciousness projection. A number of descriptions exist that attempt to describe exactly what the kundalini experience is: Sri Ramana Maharshi mentioned that the kundalini energy is nothing but the natural energy of the “self”, where self is the universal consciousness (paramatma) present in every being. Advaita teaches that self-realisation, enlightment, nirvana, pure consciousness, but initial kundalini awakening is just the beginning of actual spiritual experience. Swami Vivekananda described kundalini briefly in London during his lectures on raja yoga as follows: “According to the yogis, there are two nerve currents in the spinal column, called pingala and ida, and a hollow canal called sushumna running through the spinal cord. At the lower end of the hollow canal is what the yogis call the "lotus of the kundalini". They describe it as triangular in form in which, in the symbolical language of the yogis, there is a power called the kundalini, coiled up. When that kundalini awakes, it tries to force a passage through this hollow canal, and as it rises step by step, as it were, layer after layer of the mind becomes open and all the different visions and wonderful powers come to the yogi. When it reaches the brain, the yogi is perfectly detached from the body and mind; the soul finds itself free. We know that the spinal cord is composed in a peculiar manner. If we take the figure eight horizontally (∞) there are two parts which are connected in the middle. Suppose you add eight after eight, piled one on top of the other, that will represent the spinal cord. The left is the ida, the right pingala, and that hollow canal which runs through the centre of the spinal cord is the sushumna. Where the spinal cord ends in some of the lumbar vertebrae, a fine fibre issues downwards, and the canal runs up even within that fibre, only much finer. The canal is closed at the lower end, which is situated near what is called the sacral plexus, which, according to modern physiology, is triangular in form. The different plexuses that have their centres in the spinal canal can very well stand for the different "lotuses" of the yogi.” Yogis add that the more one analyzes the experience, the less it occurres. The question arises: how is this awakening triggered? There are two broad approaches to kundalini awakening: active and passive. The active approach involves systematic physical exercises and techniques of concentration, visualization, pranayama and meditation under the guidance of a competent teacher. The passive approach is instead a path of surrender where one lets go of all the impediments to the awakening rather than trying to actively awaken the kundalini. A chief part of the passive approach is shaktipat where one person's kundalini is awakened by another who already has the experience. Shaktipat only raises the kundalini temporarily but gives the student an experience to use as a basis. The hatha yoga text, the Goraksasataka or Hundred Verses of Goraksa, prescribes mula bandha, uddiyana bandha, jalandhara badha and kumbhaka. Another hatha yoga text, the Khecarividya, states that, the tongue being connected to the sushumna, kechari mudra enables one to raise kundalini and access various stores of amrita in the head, which subsequently flood the body. The experience of kundalini awakening can happen when one is either prepared or unprepared. According to Hindu tradition, in order to be able to integrate this spiritual energy, a period of careful purification and strengthening of the body and nervous system is usually required beforehand. Yoga and tantra propose that kundalini energy can be awakened by a guru (teacher), but body and spirit must be prepared by yogic austerities such as pranayama or breath control, physical exercises, visualization and chanting. Patanjali emphasised a firm ethical and moral foundation to ensure the aspirant is comfortable with a reasonable degree of discipline and has a serious intention to awaken their full potential. The student is advised to follow the path in an openhearted manner. The kundalini can also awaken spontaneously, for no obvious reason or triggered by intense personal experiences such as accidents, near death experiences, childbirth, emotional trauma, extreme mental stress and so on. A spontaneous awakening in one who is unprepared or without the assistance of a good teacher can result in an experience which has been termed as "physio-kundalini syndrome", "spiritual emergency" or "kundalini syndrome”. The symptoms are said to resemble those of kundalini awakening but are experienced as unpleasant, overwhelming or out of control. Unpleasant side effects are said to occur when the practitioner has not approached kundalini with due respect and in a narrow egotistical manner. Kundalini has been described as a highly creative intelligence which dwarfs our own. Kundalini awakening therefore requires surrender; it is not an energy which can be manipulated by the ego.